Recruiters like very long Boolean search strings. Why? It seems that the more synonyms and keyword variations you include, in long OR statements, the better control you get over the results and the more relevant results you will find. It’s common to run searches on Google that push the 32 keywords limit. The truth is, this approach used to work well, but no longer does. Simple searches (and varied simple searches, run one after another) do better than searches with long OR statements. Let’s take a look at a simple example and compare the search results for a string that spells out synonyms vs. a string that doesn’t. In theory, the string with OR’s (the one on the left) should provide more results, but obviously, this theory is outdated! In many cases, there’s no need to include OR statements in Google searches because Google knows about synonyms and keyword variations and will include them automatically. 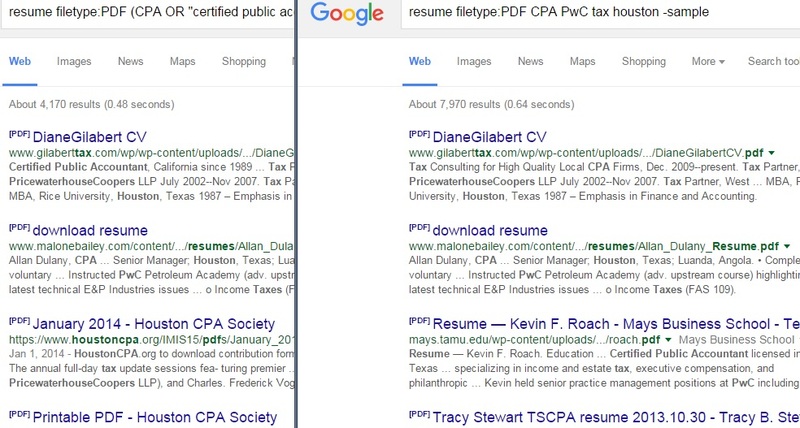 If you search for CPA, it will also search for “certified public accountant”. Remembering that would allow to shrink many favorite saved and reused strings to fewer keywords (and better readability). Not only including long OR statements doesn’t help, because Google would search for synonyms anyway, it may hurt the search. It seems that Google is increasingly “disliking” complex searches and does less than stellar job providing relevant search results. You can think about it this way: when we give Google the space to make sense of the query (vs. controlling the query with overly complex syntax), Google works harder. No question about it, Google Boolean search can produce fantastic search results; it’s just that the search style we use needs to be different than ten years ago.